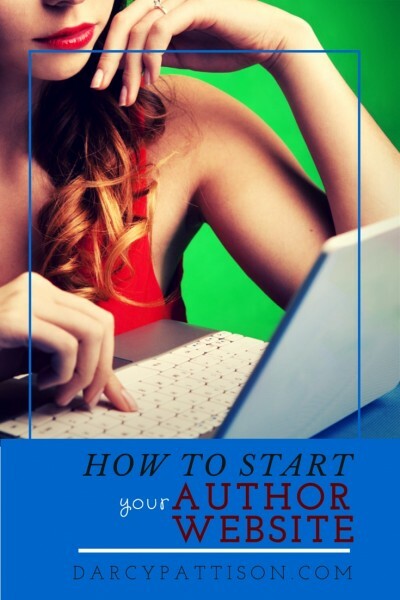 One of the more popular series I’ve written is 30 Days to a Stronger Author Website. It breaks the process of creating an author website and blog into a series of daily tasks. Theory covers the WHY, WHEN, and HOW. Technical aspects are covered in depth. More important, it gives solid reasons for WHAT, or the content of your site. Learn what readers want on each of these pages: Home, About, Books, News, Contact, Privacy. Get ideas on how to write your first 15 blog posts. But first you need a site. This post will lay out a clear, simple, 15-minute process for starting your website, with lots of visuals. For other details, read the 30 Days to a Stronger Author Website series. Some of the links below are affiliate links, meaning, at no additional cost to you, I will earn a commission if you choose to make a purchase. Thank you for your support in this way. First, you’ll need to decide where to host your website/blog, or where your computer files will actually live on a server. While some opt for free services, I’ve had a self-hosted WordPress site/blog for over seven years and love the freedom of doing whatever I want on my own site. I don’t have to worry about the terms of service, because I create my own policies. 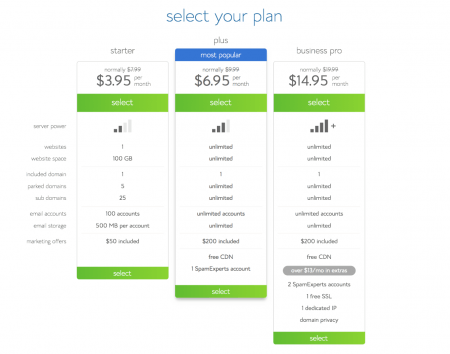 While there are multiple options for hosting, one of the most popular is Blue Host, which I recommend because of its simplicity and reliability. Click here to go to BlueHost. This opens a new window so you can go back and forth on the instructions here. Next, you’ll need to choose a plan. All of BlueHost’s plans come with one free domain, so there’s not an extra step for registering that–it’s a one-stop service. Authors, you should use your name or pen name for your domain. And get a .com if at all possible. This website is DarcyPattison.com. Sometimes, you may want to create a website for a book, so you can use a book title, if desired. But the gold standard is your name. 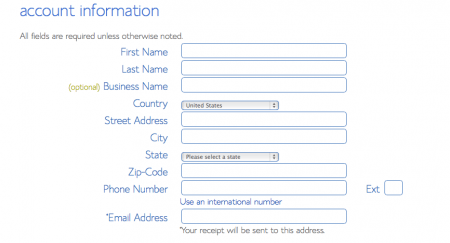 If you already have a domain, BlueHost makes it simple to switch over; just use the Transfer Domain box. You’re almost there. Fill in the form with contact info. Make sure the email is working because that’s where you’ll receive information about how to login. You have a choice now of hosting packages. I’m always amazed at the affordability of a self-hosted package. I rarely add on any of the extras. Some people like the privacy option, but I’ve never found it necessary. Of course, it’s time to fill in your billing information. Read the Terms of Service and policies and confirm. Then click NEXT. You’ll be asked if you want upgrade; I usually skip all these. You can always add things later, if you need something. Instead, skip over to your email and find the welcome email from BlueHost. It’s time to look at your dashboard or the backend of your site. Most hosting companies use a CPanel. 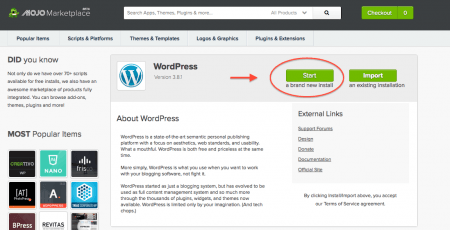 You’ll want to read more later on CPanel basics, but for now, we’ll cover how to install your WordPress site. Go back to BlueHost and Click LOGIN at the top. Use the info you received in your welcome email to login. At first the CPanel can look overwhelming (read more on CPanels here), but we just need to install the WordPress that’s listed under Website Builders. 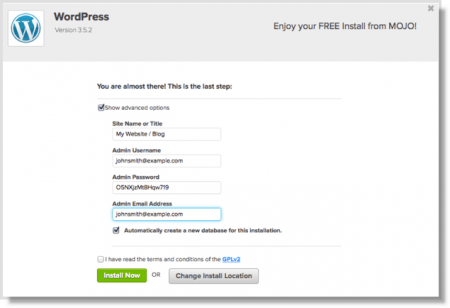 Click on the website where you want to install the WordPress blog. Usually, you leave the directory blank. Your WordPress user information is important. Do NOT use ADMIN. This will be your login information for the site, so create this with care. Click on the Advanced Options and fill in your site information. Don’t worry: you can always change this later. The admin email is also important because this is where you’ll get emails about the site. When you’re sure everything is correct, click Install Now. You should see a “SUCCESS” status. Wahoo! 5) Log in to Your Author Website! 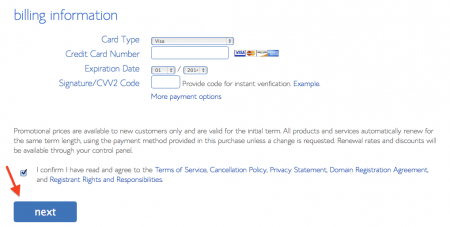 You should receive an email with login instructions. 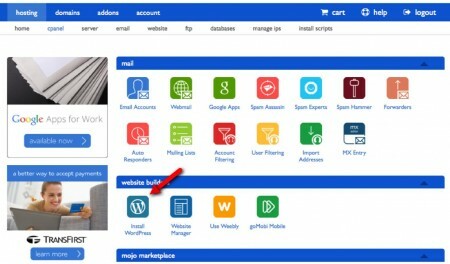 Basically, you’ll go to www.YourWebsite.com/wp-admin/login (Replace YourWebsite with the name of your site). Now, the fun really begins. It’s time to create some content and get your site/blog going. First, you’ll want to customize your WordPress installation, develop the functionality of the site with plugins, and choose a theme that governs how it looks. No worries! 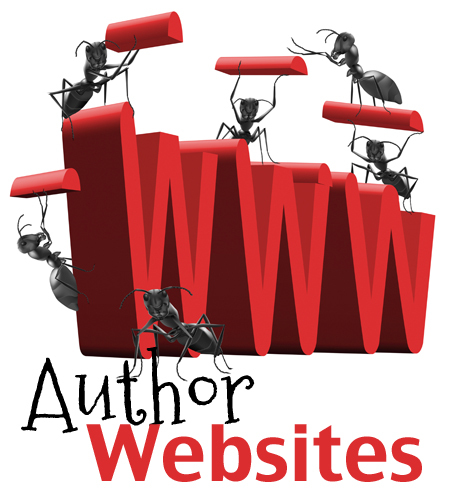 The 30 Days to an Author Website series will walk you through the next few days! I think it may also be worth looking into blogger for first timers. Blogs are easy to set up and run, plus you can get a custom URL for only $10 a year. Most authors sadly don’t get enough traffic to make hosting an issue, and if they do, they’re probably successful enough to hire someone else to take care of the details. I totally disagree. I think you should always have your own hosted domain. It’s not that hard and its important to have control of your own site. You should believe in the importance of your own site and not leave it to your publisher.